It's been warm out both day and night for at least a week. And is scheduled to do so for several more days. But cold weather is on the way. Tomato and cucumber plants are fading. What is flowering now will never produce any fruit. There just is not enough time left. The hoop house is being cleared off all summer vegetables. 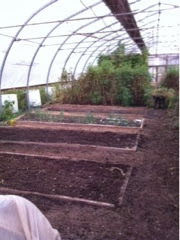 The winter vegetables will be planted over the next 4 weeks and harvested all winter. Under the protection of the hoop house we grow all year. There are greens and root vegetables all over. Carrots planted months ago are getting ready to harvest. They get sweeter with cold weather, so harvest will happen in later October, after colder nights. For now it is still all about the tomato. 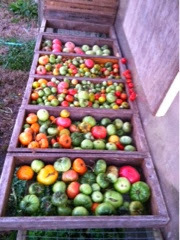 Ripe ones, half ripe ones and green tomatoes. We don't let any go to waste. Green tomatoes sliced, dredged in cornmeal and then fried in oil. Ripe parts of tomatoes into salads. Not so pretty ones frozen or canned for putting into a Dutch oven with many other things for a delicious slow cooked meal. Rotten tomatoes and the dying vines to the pigs. All around good.